Officially supported by Honda (UK) and managed by four times Motocross World Champion and Buildbase Honda Team Manager, Dave Thorpe – with the help of British Motocross Championship contender, Stephen Sword as Head Coach – the new off-road experience centre will be open for business from early 2013 and offers a purpose built training and experience facility on private land in the stunning South Wales countryside, just 18 miles from Cardiff. The Dave Thorpe Honda Off-Road Centre offers expert tuition in Motocross and Enduro, with individual experience days and taster days incorporating both of the above disciplines (plus a Trials section) available. 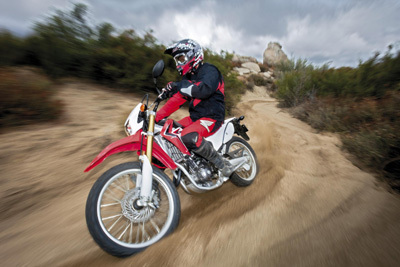 Groups of all ages and abilities are catered for and all have the chance to ride Honda's full range of off-road bikes, including the CRF250R and CRF450X and CRF250L. What’s more, because the centre is situated on private land, there’s no need to have a motorcycle license to ride! Dave Thorpe: “We are really excited about this new venture and with the support of Honda (UK) we can offer the chance to all types of people, from all walks of life, to get into off-road. The centre will cater for a range of abilities, whether that is an expert looking to sharpen up on their technique or a beginner interested in trying off-road for the first time. Honda makes the best off-road bikes in the business and the beautiful South Wales countryside is the perfect location to really put them through their paces, with expert tuition and instruction on hand. Bookings are already being taken for February 2013, so book now to secure what would make the perfect Christmas present. For more information about Dave Thorpe Honda Off-Road Centre, visit davethorpehondaoffroad.com. You can also register at davethorpehondaoffroad.com/vip to become a VIP, receive the latest deals and to be in with the chance of winning 4 x Maxxis British Championship tickets to a round of your choice in 2013!